The CATRI is an attractive and beautifully finished boat. Rounded shapes have been used, not only adding to functionality, but when combined with the broad overall beam, curved crossbeams (akas) and full stern, giving a sleek and futuristic appearance to a boat that is at home in the 21st century. 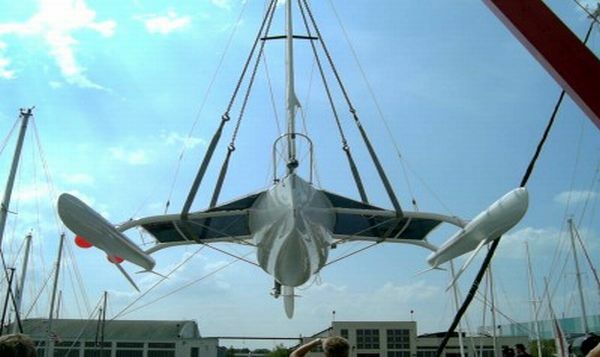 Below is a CATRI 24 being craned in 2004. The new 25 (above) and 28 are even more impressive. Much attention has been paid to surface finishes and interior design and trim. Teak or Mahogany trim is available, a pleasant contrast to the cloth upholstery and light toned ceilings.